Do you have a fear of picking the wrong fabric for your vintage dress patterns? I've gathered from some beginners' questions that this can be a scary, even paralyzing, topic. It does take a bit of practice, but it's really nothing to worry about too much. Selecting fabric should be inspiring, not a thing of dread. I thought I'd share the tips I've picked up along the way. Let's dive in! Now, think about your pattern and envision your ideal finished garment. Does it flow over your body glamorously, like this little dress from the 40s (below)? Next, look at the pattern details to give you clues: the silky necktie, the soft tucks at the shoulder, the way the skirt clings slightly to the body. This pattern screams for a fabric with drape. How about a nice silk crepe, georgette, or even a charmeuse? If you wanted to do wool, a lightweight crepe would work well. 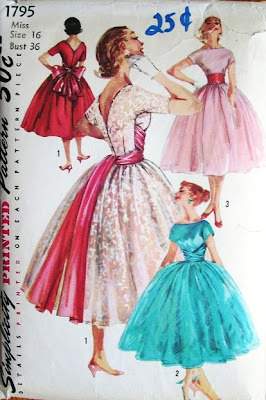 Or perhaps you want your finished garment to have a certain perky stiffness to it - like the fabulous full-skirted 50s cocktail number below. Look at the way the skirt stands out from the body, and the bodice looks tailored and structured, rather than drapey. This pattern would be great for a fabric with tons of body - maybe a silk faille, cotton or silk broadcloth, or shantung. Another thing to consider is the weight of the fabric. The full-skirted 50s dress above could be made with a variety of weights, depending on the look you want. (The one key thing for this pattern is that the fabric should not be so heavy that it won't gather well for the skirt.) A shantung will be stately and heavy, while a sheer cotton organdy will be light as a feather. Still, both of these fabrics have body. Lastly, think about whether your dress has any tailored elements, like a shawl collar and cuffs. Look at the lovely pattern below. Can you imagine trying to tailor that collar in charmeuse? Yikes! Tailored details need just a little bit of body, but even a lightweight wool crepe backed with fusible interfacing could work. Just remember not to go too drapey for this sort of thing. I hope this has been helpful! Please let me know if you have questions. Or if there's anything you want to add! P.S. You'll notice that I've only mentioned woven fabrics, not knits. It was pretty rare to sew with knits in the 40s and 50s - except for wool jersey. If you want to try wool jersey, find one with a stable hand (not too stretchy). I'd generally only recommend trying it on a pattern that has more drape rather than body. It looks great in blouses (like this one I made!) and soft skirts. I tend to respect the indications on the back with regards texture/ type of fabric. I'm not very adventurous on that score because if I like the line of a pattern, I'll want to try as hard as possible to replicate it and don't want to spend hours on a garment that looks floppy where it should look perky, or stiff where it should be slinky. I'm also a bit scared of mixing types of fabric as they might look fine when just made, yet come out very differently in the cleaning (referring back to yesterday's topic; although now I have learned how to pre-treat, this should no longer be an issue!). My big problem however is I have found a real divide between the kind of fabrics I love and the styles I favour. I'm a sucker for big prints but find that many of my 40s - early 50s vintage patterns work better with single colour or smaller print, concentrating on the line of the clothing, rather than showcasing the design of the print. I keep going through my stash of fabrics, and finding that even when the yardage is OK, the print is all wrong for the patterns. I think my problem is that I started buying fabrics first, then patterns, yet the more I sew, the more I learn that one should allow the pattern to dictate the fabric, as it doesn't always work the other way round. This was one of the better posts I've seen on this subject. Thanks! Gertie, what are your thoughts on finding a pattern to match a fabric? Often I buy fabrics because I love them but then agonise for ages over possible patterns, and of course the range of new and vintage patterns is mind-boggling. E.g., I recently bought 3 metres of a beautiful viscose print (navy/pink/cream floral design) but I just can't think what kind of pattern would suit it best. And yet I'm itching to start sewing with it! Why can't ALL infographics be so clear and concise? That one makes me want to shove some fabric into wine glasses, too. Love this post, and your photos and descriptions go together fantastically. Thanks so much. I've been sewing for a million years and the make I STILL make is choosing the wrong fabric. Fabric design is another consideration. I like prints for blouses and I like blouses with design elements. The prints I choose usually make the design elements invisible. Your guidelines apply to all patterns - not just vintage. This post was so helpful, Gretchen. The analogy with the glass is a perfect illustration. Thank you so much for clearing this up for me. That little picture from Weekend Sewing is so cute! Great post on this. My advice, also, is to always use all natural fabrics if possible! Cotton, silk, and wool are pretty much all they had in many of the decades we love to copy... poly/rayon linings are ok, of course, but almost always, the stuff at JoAnn's just does not cut it. Try shopping online at places like www.FashionFabricsClub.com for discounts on real silk. Yum! This has been a major problem for me with sewing. I fall in love with fabrics and buy them without a specific project in mind. Then when I buy patterns, I usually ignore the cover illustration and buy them for the line drawings. So I often end up 'matching' potential fabrics to patterns, which sometimes works and sometimes doesn't! Like Nathalie I also love prints and have discovered to some considerable expense and disappointment that what looks amazing flat doesn't necessarily work on the body or with certain styles. Thanks for this. It made it a little easier to think about the whole drape/body thing. I'll still likely wander around fabric stores agonizing for hours/days, but it is helpful to think about how some of the details of a pattern might work out in different fabrics! Really, really love your blog! Great visuals with this post - I have some fabric I would *love* to drink! Thanks Gertie! the ilustration of the wine glasses is great!! this post has helped me a lot! As I'm new sewing this is great for me. I love that illustration! So cute, but so well put too. I want to stuff my fabric into wine glasses too! 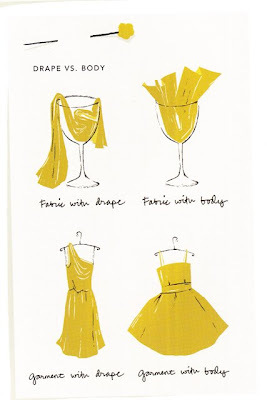 That is such a good illustration of drape vs body. Thanks for this post too! I hadn't framed it in quite those terms before, so that definitely helps. Extremely timely too. 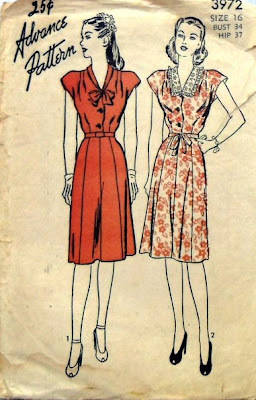 This weekend I have to decide whether to make a favorite 40s dress pattern with the fabric I bought for it or not. It's this amazing wool but I can't decide if too heavy for the dress. Seems so soft and drapey but then prepping the yardage it just seems so heavy, I worry I'm deluding myself. It would either be my favorite dress ever or a really miserable failure! We'll see! It's just going to take a lot of trial and error. 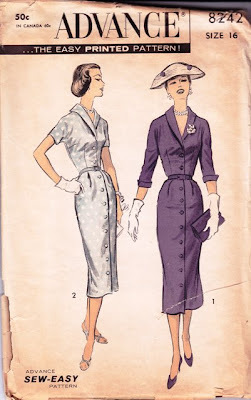 It's especially challenging with vintage patterns though because they so often don't have any fabric recommendations at all, or if they do they are often fabrics not readily available today. It's challenging enough locating a simple wool crepe out here in flyover country. Great article! When I started sewing, I made many a fabric selection mistake and it was almost always do to wrong amount of drape or body. Great post, clear and informative, thank you!